YES We have Big Dish Movers in stock. Strong - Simple - Easy Setup Dish Mover. Works Great with the Rainier D9865 Satellite System. Accurate, Dependable, Bug Free Operation for Large Dishes. Get your big dish connected to the world’s best mini tracker available on the market today. The Rainier Satellite Mighty Mini supplies a powerful 36 volt high amperage current to your actuator for high torque accurate flawless movement. Features a two digit numeric LED positional display so you know exactly where your dish is pointing. Four LED bar display operate in sequence to give quick indication to direction dish is traveling. Storing satellites is simple, press one button that’s it. Finding your favorite satellite locations is quick and easy with our direct remote keypad one button operation. Safety stop feature stops dish movement instantly by touching any key on the remote. The Mighty Mini can store up to 32 direct entry satellite positions in its non-volatile memory. Power outages can't wipe it out. Includes a fine quality full size IR remote. 115 volt AC operation. This unit does not control polarity for use with servo feeds. For polarity control order our Core Electronics package below where all parts needed for this is also included. 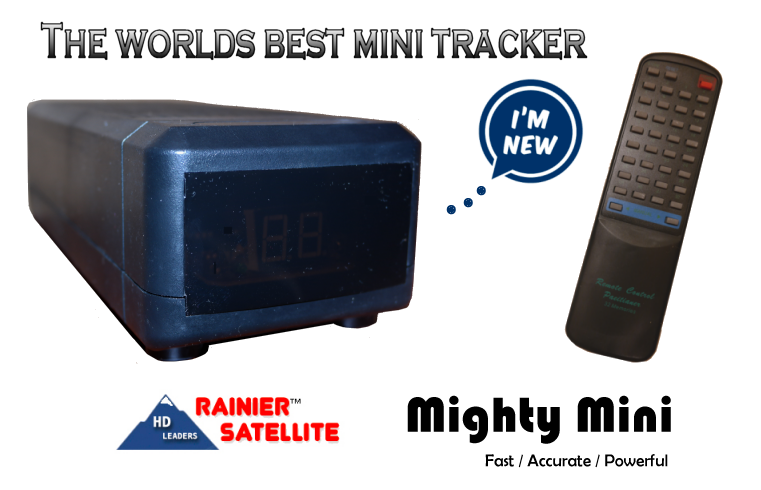 The Mighty Mini offers the highest quality and value with features no other satellite dish Tracker Controller can match. The Mighty Mini makes it is Easy to see your dish is in motion and the direction it’s headed. 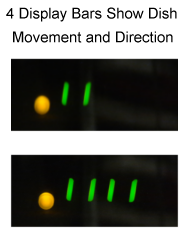 Utilizing four sequential bars gives you instant status reports of dish in motion condition and direction. Standard Model (MMBDT-S) Recommended for up to 10 ft mesh dish in non extreme conditions. Short on Cash? PayPal Credit Available. Order Mighty Mini MMBDT-S here. Introducing the Mighty Mini's Big Brother! Heavy Duty Strong - Simple - Easy Setup Dish Mover. Accurate, Dependable, Bug Free Operation for Larger Dishes. Get your big dish connected to the world’s best mini tracker available on the market today. The Rainier Satellite Mighty Mini Heavy Duty model supplies a powerful 36 volt high amperage current to your actuator for high torque accurate flawless movement. The HD Plus model includes Rainer's Proprietary PPPT nine element Power Punch Plus circuit with thermal overload shutdown and surge / spike protected M1 & M2 inputs. It’s designed for cold climates and installs where an extra startup punch is needed. Features a two digit numeric LED positional display so you know exactly where your dish is pointing. Four LED bar display operate in sequence to give quick indication to direction dish is traveling. Storing satellites is simple, press one button that’s it. Finding your favorite satellite locations is quick and easy with our direct remote keypad one button operation. Safety stop feature stops dish movement instantly by touching any key on the remote. The Mighty Mini can store up to 32 direct entry satellite positions in its non-volatile memory. Power outages can't wipe it out. Includes a fine quality full size IR remote. 115 volt AC operation. This unit does not control polarity for use with servo feeds. For polarity control order our Core Electronics package below where all parts needed for this is also included. Our Mighty Mini Heavy Duty version includes Clean Power Technology. No other Tracker offers this. This Rainier Exclusive technology supplies your actuator with pure filtered power. It prevents noise that can cause corrupt pulse counts that bring on unnecessary tracking errors. It also allows the dish to move smoothly and faster than units not offering it. This prevents under and over shoot of the target satellite. Order Mighty Mini MMBDT-H here. International orders customers are responsible for any customs or duties fees. This is the Commercial Grade "Robust" version Maxi ball for those with heavier dishes or for those who just prefer a Cadillac vs a Chevy. This unit will provide years of reliable service. Works Great with the Rainier DH 9ft Satellite Dish and others. Accurate, Dependable, All Weather Operation for Large Dishes. Dump that old buggy servo feedhorn and old analog LNB! Upgrade to Professional Broadcasters Technology! 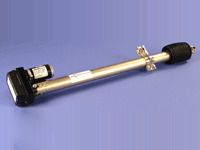 This Replaces your old LNB - Feed - & Mover for Simple Stable All Weather Operation. Two NJR 8487H High Stability TI Rejection PLL LNB's. 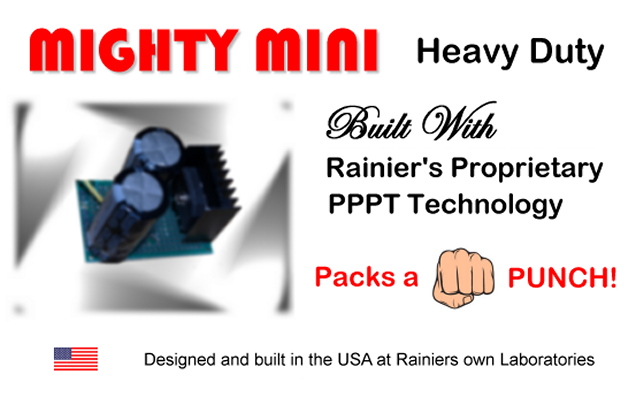 Rainier Mighty Mini Dish Mover Standard or Heavy Duty Model. Rainier approved dual polarity switch (High Isolation Design). This is the package for those who demand the best. It contains everything needed to rid yourself of the old 4DTV or old clunky dish mover polarity control you may be using. It simplifies dish moving and polarity control using the Rainier D9865 receiver. Kit include two 3.65 to 4.2 GHz tuned NJR 8487H High Stability TI Rejection PLL LNB's. with a Ultra Low Noise Temperature of 15 K • Local Stability: +/- 10 ppm ( 50 kHz typ. ) 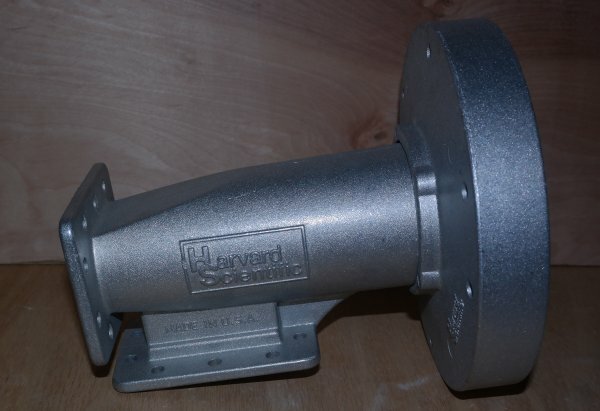 • Harvard Scientific Tuned Ortho Feedhorn, Mighty Mini Dish Mover & Professional Polarity Control Switch. Once hooked up and programmed. all you do is move your dish with the remote and tune the Rainier Receiver to channel you want to watch. Simple Simple... No fine tuning needed. The Best Satellite Upgrade Package is Back! Short on Cash? Financing Available with PayPal Credit. Order with Mighty Mini Standard Model. Order with Mighty Mini Heavy Duty Model. Upgrade your LNB & Feed to the Worlds Best Combo Today! Used by Professional Installation Sites Worldwide! NJR LNB's offer Improved Performance over Norsats and others. Small (Mini) LNB Footprint fits well under feedhorn covers. Click pictures below for larger image. Designed in the United States. 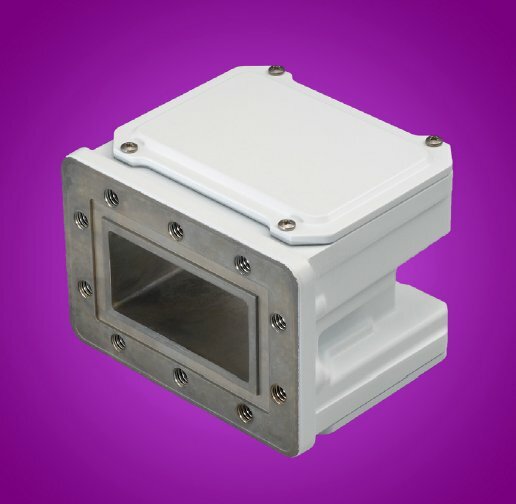 Precision cast-aluminum body, scalar and waveguide. Durable polyurethane powder coating. Mounts to button-hook, tripod and quad leg dish supports. Cast-in f/D gauge Single set-screw adjustable scalar ring. Through and threaded mounting holes. Bolts not included. 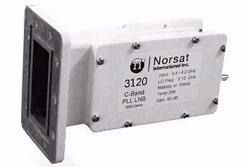 Norsat 3120 C-Band PLL LNB. Norsat 3120 High Stability PLL LNB. 3.40 to 4.20 GHz. LO Stability 1.0 ppm ±5 kHz.  Noise Temperature: 20 K. Type F connector. The 3000 Series is Norsat's premium pro quality C-Band LNB. The preferred LNB for all C-Band applications. Norsat LNBs are graded by Stability and Noise Temperature to provide the perfect balance between required performance and cost Proven reliability for lower lifetime costs. Excellent PLL LO stability to control receiver drift and employ lower bit rates or narrower space segment. Excellent Phase Noise to Lower Carrier to Noise margins, improving BER. Ortho Feed Requires Two (2) C-band LNBs. Tuned Design Feed for High Gain and Excellent Rejection. Get it with 2 NJR LNB's in our Tuned Feedhorn Package above. Tuned 90 Waveguide for Ortho Feeds. 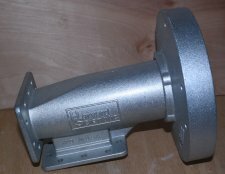 Tuned design by Harvard Scientific for low loss. 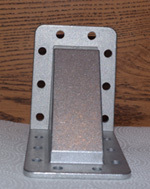 90 waveguide elbow allows a cover to be used when using ortho feed with 2 LNB's. Made in USA. Contact customersupport@rainiersatellite.net or Call 509-486-4137 for price and to special order yours today. Don't See it? Contact Us about your other C band parts and install need's. Dishes, Actuators, Ribbon Cable & other Coax, etc. Were able to get most products needed for your full C band install. Contact: customersupport@rainiersatellite.net or Call 509-486-4137 for more information.